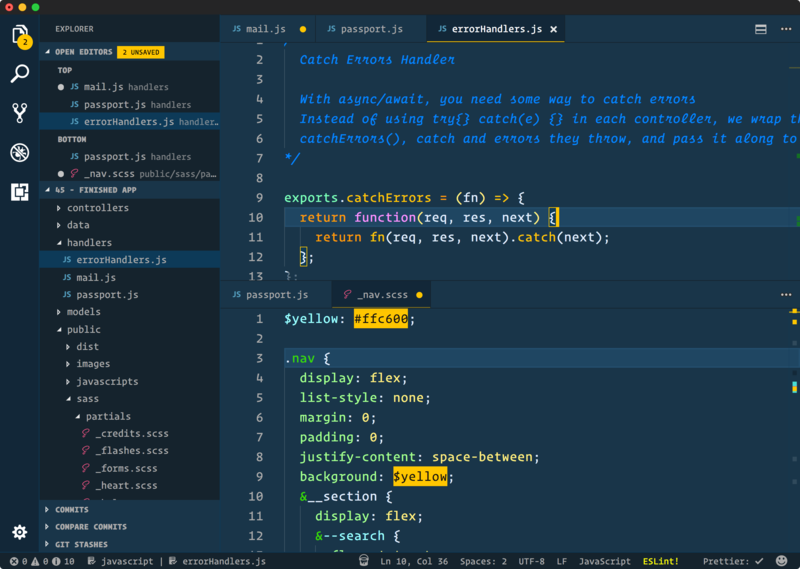 Visual Studio Code>Themes>Cobalt2 Theme OfficialNew to Visual Studio Code? Get it now. Search for Cobalt2 - find the one by Wes Bos - there are a few other half-baked ones so make sure you have the right one! Some things in VS code can't be controlled by settings, but you can install this plugin, then make a file on your computer that will hold your custom CSS, I like to make one in my root called ~/.vscodestyles.css and then put this everything in cobalt2-custom-hacks.css into your file. Finally reload your editor and the Custom CSS should be taking. You can test this by typing into file - the dirty circle should be yellow not white. Set your editor to use this Cobalt2 theme - it might help to change the name in package.json to something like "Cobalt2 Dev" so you can differentiate from the Cobalt2 you've installed from the marketplace. If you get confused, just delete all traces of Cobalt2 and then load the VSIX. Press the green arrow beside "Launch Extension"
This will then open a second window. Make a change, and then hit the refresh button on your debug toolbar - this is in your first editor - not the one that poped open. Wait a sec, your changes should now be reflected! Whew. Again, if you have an easier way to style these things, let me know! These are the things we have control over. If you would like to change something, you can either open a PR and see if I'd like it added, or override the colours in your own settings.json file. Put Cobalt2 in other places! Thanks to Roberto Achar for doing much of the initial porting to VS Code.